Do You Need Cover Song Performance Tracks? Original song Performance Tracks? To record with? To perform onstage with? Drums? Bass Guitar? Drums and Keyboards? Full Band? You or your singing friend you'd like to gift with a session are coming to Nashville area? As Low as $150 per song for pre-recorded tracks of popular covers, IN YOUR KEY, including recording your vocal, mix and master (3 song minimum)! As low as $300 for a custom piano/vocal (or guitar/vocal) No minimum unless coming to the studio to record your vocals, then there is a 3 song minimum. As low as $500 for a fuller band sound, custom made! No minimum unless coming to the studio to record your vocals, then there is a 3 song minimum. "Kissin" © 2016 Joe Finley. All rights reserved. Published by Listen Again Music (BMI). Posted for demonstration of production values. All other uses are a violation of U.S. and International copyright law. Players: Jim Riley, drums; Jenee Fleenor, fiddle and mandolin; Brent Mason, acoustic and electric guitars; Steve King, piano and organ. Bill Watson: bass guitar, arranged, produced and mixed. 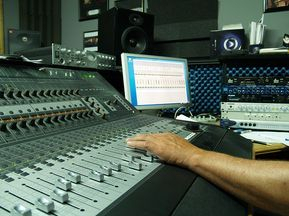 It's Easy to perform or record with our cover tracks played by Nashville studio pro's! 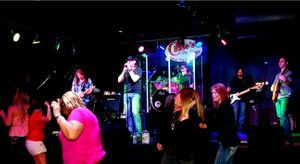 Yes, Our clients make excellent money using our tracks to perform with at parties, clubs, weddings and corporate events! Start out with just five to fifteen full band performance tracks and use a portion of your performance income to pay for more! How will it work out for you? Ask Rob Piatt of Brazil, Indiana. We just produced a performance track for Rob of his original, God's Plan (finished on 1-11-16). He received the two mixes (a full no-vocals mix, and a no-vocal mix, with acoustic guitar removed so he can play along on acoustic in alive performance situations ). I absolutely love it! You said you had the musicians who would knock it out of the park and they did! So who are the players getting credit for this masterpiece? With the acoustic guitar out of the mix, Rob can sing and play acoustic himself. We can provide multiple mixes with whatever instruments you need pulled from the mix. This will allow you to offer your clients different configurations of your act. If they can only afford you singing, give them the "all in" mix. If they can afford a live drummer, give them a live drummer playing with the "drums out" mix. Bill Watson (Nashville Trax Producer): Bass Guitar, arrangement, mixing. God's Plan © 2016 Robert Piatt. All rights reserved. Posted for demonstration of production values. All other uses are a violation of U.S. and International copyright law. Country? We have Conway Twitty to Blake Shelton. Oldies Rock? Joe Walsh to Deep Purple. Motown? Diana Ross to The Jackson Five! We'll cut the original or cover song you need karaoke style, with the instruments you need in the key you need! Unlike most karaoke tracks of dubious quality, usually with all parts played by one musician on a keyboard, we use a real session drummer, real bass guitar etc. for superior performance and sound. For pricing e-mail nashtrax@bellsouth.net placing "Performance Track!" in the subject area. In the body put the title of the song(s) you'd like a quote on and the artist who made it famous. Uptown Funk, Bruno Mars style. Smoke From A Distant Fire, Sanford Townsend Band style. "Awesome Bill! Can't wait to hear the harmony! This is going to be my new radio single!!! My last one went to #24 on the Bluegrass Charts"- Mike. "After receiving the mix I played it through the sound system at our church probably a dozen times. Played the piano and sang along with the track. WOW! MOVING!!! EMOTIONAL!!! I really like it! Much gratitude to Bill and all the players for a job well done! "- Rob Piatt, Brazil, IN regarding his second performance track, "Father Forgive Me". Everything is sounding good. Rehearsed with new tracks this afternoon. Disclaimer has taken a new direction. On my solo gigs, I have decided to open with this song, using the New part with phone eq as a "talk in" introduction of myself, then kicking it in @ v2. So cool!